IN a world of wrenching change, the Danish cartoon affair has widened a growing fissure between Islam and the West. The controversy comes at a time when many in the Islamic world view the war on terrorism as a war on Islam. They draw on memories of colonization and of the Crusades, when Western invaders ridiculed the Prophet Muhammad as an imposter. Sadly, the recent polarization obscures a rich humanistic tradition within Islam — one in which cosmopolitanism, pluralism and a spirit of open-minded inquiry once constituted a dominant ethos. European Muslims for the most part have protested the Danish cartoons but kept their protests peaceful. That is good. Stigmatized European Muslims are often the targets of right-wing attacks and feel increasingly beleaguered. But the lesson many have learned from this affair has not been the utility of freedom of speech so much as that their continued presence is an affront to European identity. Within the Muslim world, the cartoon imbroglio has given ammunition to the two entrenched forces for censorship — namely, authoritarian regimes and their Islamic fundamentalist opposition. Both would prefer to silence their critics. By evincing outrage over the Danish cartoons, authoritarian regimes seek to divert attention from their own manifold failures and to bolster their religious credentials against the Islamists who seek to unseat them. Ironies abound. Saudi Arabia leads the protests, yet is systematically destroying its Islamic heritage. The Wahhabis who dominate Saudi Arabia do not believe in honoring Islam's holy men and women or the Prophet Muhammad (they've proscribed the celebration of his birthday). Driven by sectarian zeal, the Saudi authorities have razed and dug up virtually every site in Mecca and Medina linked to Muhammad, members of his family and his companions. But these acts of disrespect and desecration have failed to arouse any protest from those who now take to the streets to condemn the Danish cartoons. Elsewhere, Sunni Muslim fundamentalist leaders express anger over the Danish cartoons, but no comparable indignation over suicide bombers who attacked Shiite Muslim mosques during Ramadan in Iraq. 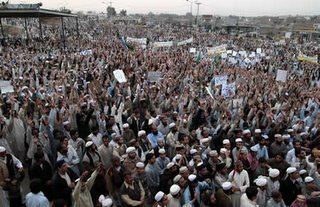 In Pakistan, blasphemy laws have been used by fundamentalists to attack Christians and Hindus. All this is a far cry from the Islamic humanism of Ibn al-Arabi, the Andalusian philosopher and mystic, or of Rumi, the Persian Sufi poet. Muslim societies have paid a dear price for the militants in their midst. Many of the best and brightest within the Muslim world have had to flee to the West to avoid being silenced or killed. Fazlur Rahman, a brilliant and deeply religious Pakistani scholar of Islam, had to flee his native land for the University of Chicago. Similarly, the Islamic studies scholar Nasr Abu Zayd fled Egyptian Islamists for the Netherlands. Naguib Mahfouz, recipient of the Nobel Prize for Literature, was stabbed in the neck in Cairo and barely survived; the Egyptian writer Faraj Foda was not so lucky. In some Western Muslim quarters, the proposed solution is more censorship — that these cartoons and similar expressions should be banned as hate speech. By that logic, shouldn't Salafist diatribes against Shiites also be banned? Shouldn't the writings of Maulana Abul Ala Maududi and his Jamaat-e-Islami, which were instrumental in persecuting the Ahmadis, a Muslim minority in Pakistan, be banned as well? Maududi's religious writings, best sellers among Muslims in the West, are suffused with an intolerant and anti-Western hue. No, the answer is not more censorship. But it would be nice if Western champions of freedom of speech didn't trivialize it by deriving pleasure from their ability to gratuitously offend Muslims. They view freedom of speech much as Islamic fundamentalists do — simply as the ability to offend — rather than as the cornerstone of a liberal democratic polity that uses such freedoms wisely and responsibly. Worse, these advocates insist on handing Muslim radicals a platform from which to pose as defenders of the faith against an alleged Western assault on Islam. Today's Muslim leaders, for their part, seem unable to formulate an ethical response to the challenges of the modern world. Moreover, their actions lead to the stereotyping of Islam. What else is one to conclude from this episode? The loudest and most murderous forces have chosen to forget the spirit of the Koran, which opens with an invocation of God's mercy and compassion and which repeatedly urges believers to practice patience and kindness. There is something very ugly about the power of the radicals, their recourse to violence, their anti-intellectualism and their ability to trample and blaspheme a more humanistic Islamic tradition. It is right and proper for Muslims to be offended, to be hurt, to protest. But we should be wary of the authoritarian voices that claim to speak and act in the name of Islam. The answer is not more violence and censorship, but rather peace, mercy and compassion. Emran Qureshi is a fellow at the Labor and Work Life Program at Harvard Law School. Welcome dost, you can come and read my blog to read my opinion on this.